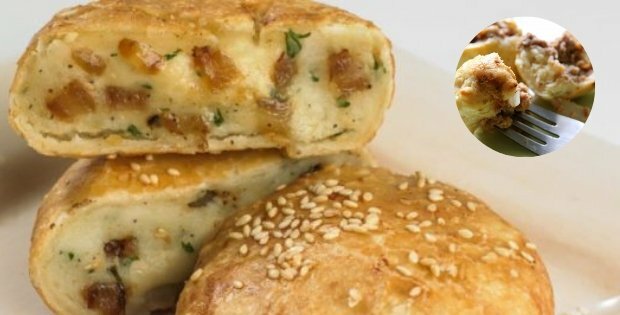 Have you heard about knishes? Well, it’s a spectacularly delicious Jewish dish that I’ve recreated to be vegan, and re-named to ‘potato rolls’, so that the name sounds more familiar to a larger part of the audience. I came across this lip-smacking recipe while compiling The 928 Tastiest Vegan Picks E-book, and I am seriously hooked! The pure ingredient mix that comes together to make this recipe possible delivers an explosion of deliciousness to your tastebuds! If you want a truly heavenly vegan recipe, look no further! This one ticks ALL the squares for texture, flavor, and a feel-good aftertaste! Prepare 2 1/2 cups mashed potatoes. To make the dough, beat together 1 cup of the mashed potatoes, the 1 tbsp oil and the salt. Add the flour and baking powder and mix well. Mix in the water and knead into a smooth dough. Let rest on a board covered with a cloth for 1/2 hour. To make the filling, sautée the onions in the tbsp oil until transparent. Mix together with the rest of the filling ingredients. Cut the dough into 4 sections, then roll each section as thin as possible (about 1/16 inch thick). Cut into 5×6 inch rectangles. Place 2 or 3 tbsp of filling in the middle of each rectangle. Fold the sides in first, then the ends. Place folded side down on an oiled cookie sheet. Bake at 350F for 25 minutes, or until golden. Serve with horseradish or mustard. For more spectacularly delicious vegan recipes that you won’t find anywhere else online, Download The 928 Tastiest Vegan Picks – 928 mouthwatering vegan dishes, hand-picked from the world’s BEST cookbooks!